B & S Originally uploaded by thesnodgrass. 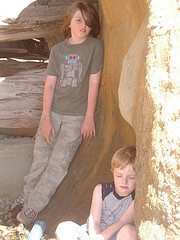 Fossils at Muir Creek Originally uploaded by thesnodgrass. 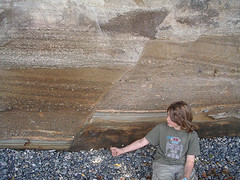 on the beach at Muir Creek there is this giant wall of sandstone and mussel shells fossilised from mllions of years ago. 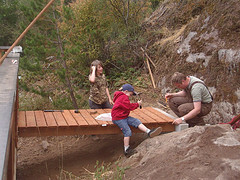 The Ramp Originally uploaded by thesnodgrass. 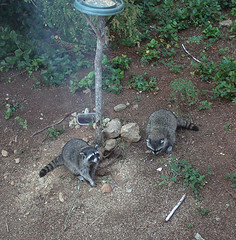 Raccoons raid the bird table Originally uploaded by thesnodgrass. Concrete Originally uploaded by thesnodgrass. 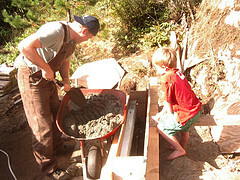 We all got up to start at 7am to make this concrete wall before it got too hot to do anything. 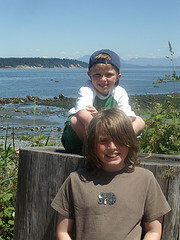 It was a scorcher. IMGP2440 Originally uploaded by thesnodgrass. 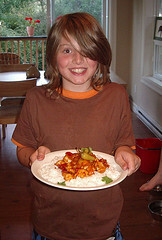 what a great meal he made too !It was chicken and peppers in a garlic and sweet chilli sauce on a bed of rice.Sam and he made yoghurt and fruit dessert with smarties in it.Scrumptious. The temperature has been in the thirties recently but the snow on the mountains is still there. How is this possible? how? come on someone, tell me. The new shelves Originally uploaded by thesnodgrass. It was a bit like an Amish barn raising. 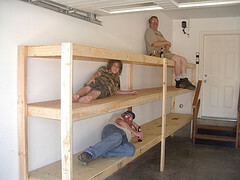 Barney and I built these shelves but we needed help from Tom and Merle to get them erected. The Amish might have frowned on all the beer drinking though. 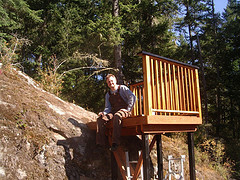 Grand Poobah of the leopard lodge Originally uploaded by thesnodgrass. 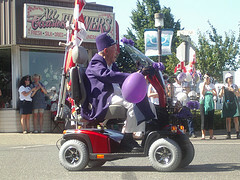 Whilst camping for the long weekend at Miracle Beach we went to the Campbell River Canada Day parade. 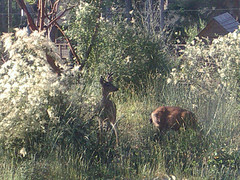 2 deer in the garden Originally uploaded by thesnodgrass. these blighters have eaten all the flowers off the plants Wendy was growing. They even chewed the chilli peppers which were supposed to be deer proof.